Fyodor Drugov was born on June 17, 1891 in St. Petersburg. At the age of fourteen he became involved in the St Petersburg group of SR-Maximalists between 1905 and 1907. He was involved in expropriations and subsequently arrested. At first sentenced to death, due to his age he escaped execution but was sentenced to two years in prison and then to exile for three years in Narym in Siberia alongside the Bolsheviks Sverdlov and Kuibyshev. He married in Siberia and became the father of three children. He was drafted into the Army in 1917 and fought at the front as a private. He became an anarchist individualist in 1917. He took an active part in October Revolution. As one of the anarchists of the Petrograd Military Revolutionary Committee, along with Akashev, Bleikhman, Shatov and Yarchuk, he took part in the events in Petrograd on October 24th-26th and had a key role in the storming of the Winter Palace. He was recommended for this role by the old SR Maria Spiridovna and various Bolsheviks. As he wrote “I was lying in a military hospital when I was told that serious events were brewing. Despite the protests of the doctor, I checked out and rushed straight to the Smolny….There I met Marusya Spiridonova, who explained everything to me and informed me that the Left Socialist-Revolutionaries were acting together with the Bolsheviks against the Provisional Government. She asked me to join the Petrograd Military Revolutionary Committee, in which the Bolsheviks did not want to let the Left Socialist-Revolutionaries, and which they were ready to tolerate me, as an anarchist, as an intermediary between the two extreme left parties. After negotiations with Lenin, I was introduced to the PMRC”. 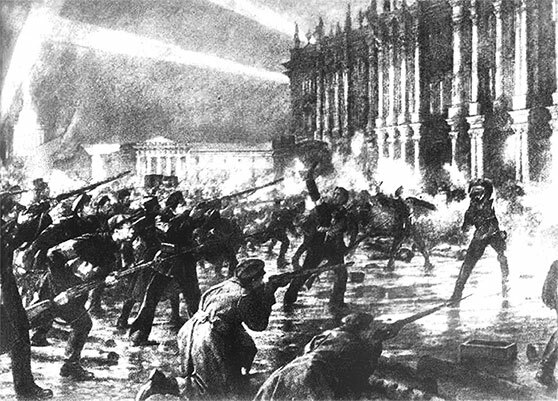 At the head of an anarchist detachment of Kronstadt sailors he participated in the capture of the Winter Palace. When revolutionary soldiers broke into the royal wine cellars he attempted to restore order. He had the break in the brick wall that had been used to plunder the cellars sealed up, but this was subsequently breached again. Drugov turned up to find that many soldiers were already drunk. Drugov went back to the Military Revolutionary Committee and discussed the problem. “Finally, a member of the committee Galkin, ….suggested that the wine from the royal cellars be given to the soldiers of the garrison to celebrate the victory and be released daily to the representatives of the units at the rate of two bottles per person per day. Thus, drunkenness was legalized and introduced into the framework” (from Drugov’s memoirs). Drugov authorised this provision, although drunken rampages by the soldiers continued for months. Drugov then took the step of joining the Cheka! (1) He was in charge of operations, that is of making arrests and taking hostages. Of the Cheka chief, Felix Dzerzhinsky, Drugov remarked that "Dzerzhinsky signed an unprecedentedly large number of death sentences, never feeling either pity or hesitation." All the time that he served in the Cheka he underlined the fact that he was an anarchist and he protested against provocations and “physical influence” – a euphemism for beatings and torture- because these were the ways of the Okhrana, the Tsarist secret police. This is confirmed by documentary evidence. However he was implicated in a large number of executions himself. When the Cheka began to move against the anarchists in April 1918 "in view of the fundamental differences with its activities In relation to the anarchists," and because “the mission of classifying hostages finally shattered my nerves” (Drugov) he asked to be dismissed from the Cheka and upon release from the Cheka board he decided to visit his family in Tomsk, who he had not seen since call-up. He also wrote several articles critical of the Bolsheviks in the anarchist paper Anarkhiia. Drugov therefore returned to Yekaterinburg, giving up all hope of seeing his family again. He was subsequently involved in suppressing various insurrections, separating “lambs from goats” at a Communist concentration camp and taking a secret letter to Transcaucasia. At the end of the Civil War Drugov ended up in clerical jobs and became an accountant working for Leningrad University. He joined the Communist Party in 1920.However a wave of purges led to him being dismissed and working as a janitor at the Prombank in 1926. Former comrades of the Civil War, seeing him clearing snow in front of the bank, averted their eyes. By now Drugov was deeply disillusioned. Finally he decided to flee to Western Europe. With two Mausers stuck in his belt and camouflaged with a white sheet, he crossed the border to Finland in March 1930. But Drugov had a hard time in Paris, with language difficulties and the impossibility of getting a job. He finally asked the Russian Embassy if he could return to the USSR. This was granted. He was immediately arrested when he crossed the border at Negoreloe on July 27th 1933. He was sentenced on 13th October 1933 and executed on February 23rd 1934. (1) A more loathsome example of an anarchist who joined the Cheka was Mikhail Frinovsky (born 1900). An anarchist communist, he was seriously wounded whilst acting as commander of a Red Guard detachment storming the Kremlin. He joined the Communist Party after the defeat of the Moscow anarchists in spring 1918. From 1919 he served in the Cheka and played a key role in smashing the anarchist underground and in action against the Makhnovists. In the 1930s he was a leading light in the NKVD and was an architect of the Great Terror. He was arrested in 1939 and shot on February 4th, 1940. Another example was Georgy Prokofiev, (born 1895), active in the Kiev anarchist communists, he fought against Hetman Skoropadsky, the Germans and Petliura in 1918. He joined the Communist Party at the end of 1919 and rose in the ranks of the Cheka. He was shot in 1937. (2) Girsh Zelikovich (Grigory Zinovievich) Besedovsky (1896-1951). In 1910 he joined the Poltava group of anarchist communists, and then was in anarchist groups in Paris and Kharkov, arrested in 1911. After the February Revolution, he broke with the anarchists. In 1917-1920 he was part of the leadership of the joint Poltava provincial organizations of the Cadets, Ukrainian Socialist-Revolutionaries and Left Socialist-Revolutionaries, and took part in the underground struggle against Denikin. In 1920 he joined the Communist Party and was involved in leading economic, and then diplomatic work. In 1929 he refused to return to the USSR and lived in Paris. Founded and edited Borba (1929-1932). During the Second World War he participated in the French Resistance, was arrested by the Nazis.